The Phillie Phanatic aimed his hot dog gun, pressed a button and fired into the stands. The duct tape-wrapped hot dog flew through the air … and hit Kathy McVay in the face. It knocked off her glasses, gave her a black eye and sent her to the emergency room. She has to ice her face every 20 minutes. The incident happened Monday during the Phillies’ home game against the Cardinals. McVay, who was sitting near home plate, told 6 ABC’s Action News that she wasn’t able to protect her face because she has a shoulder injury that she’s getting surgically repaired soon. Fortunately, tests showed she didn’t suffer a concussion. McVay is a great sport about it. 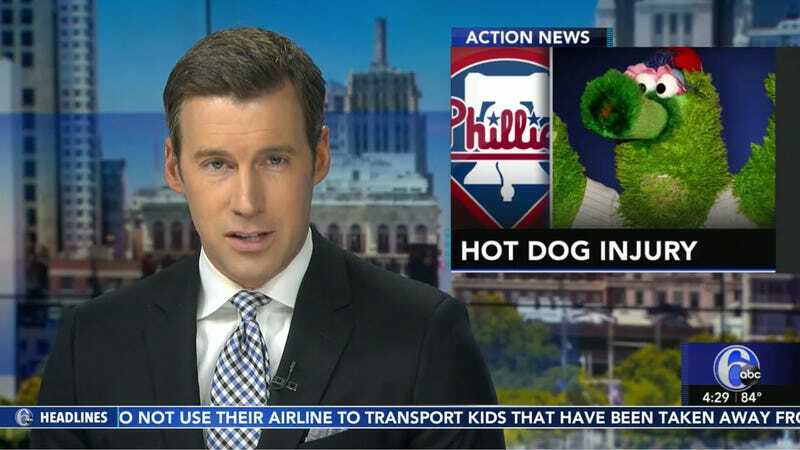 She said she’s fine if people laugh at the situation—which is great, because it is pretty funny—and was happy to talk to Action News because she wanted to warn Phillies fans of the dangers of flying hot dogs. She also says she has no intention of suing the Phillie Phanatic, a mascot who was named “the most-sued mascot in the majors” in a 2002 Cardozo Law Review article. But McVay might not have much of a case even if she wanted to sue. A fan sued Kansas City Royals mascot Sluggerr for something similar in 2010. As Philadelphia lawyer Adam Bonin recapped in a Twitter thread, the Missouri Supreme Court ruled in Coomer v. Kansas City Royals Baseball Corp. that tossed hot dogs—unlike bats and balls—were not an inherent part of a baseball game and the Royals could be sued for the incident. But when the case went trial in 2015, the Royals were found to be not at fault. The Phillies may not have to answer for the Phanatic’s hot dog shooting, but they have offered McVay free tickets to an upcoming game. 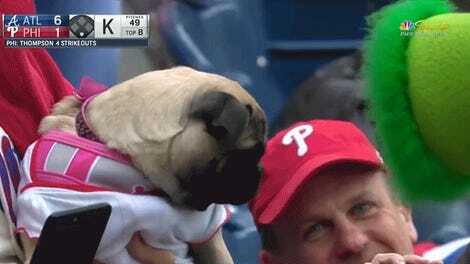 The Phanatic ought to have a bunch of hot dogs for her, and just hand them to her this time.